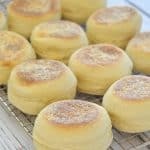 Homemade English Muffins. Nothing can beat them straight off the griddle or gently toasted. They are soft, slightly chewy & perfect for breakfast or snacks. No oven is required & they are so much nicer than store bought! If you have a stand mixer with a dough hook, add all ingredients (except the cornmeal) to the bowl and mix for around 7 - 10 minutes until the dough is smooth and elastic. My Kitchen Aid Pro suggests using setting 2 for dough. Once it forms a ball, give it a poke and check it's not too sticky. If it is add a tablespoon of flour at time, giving it a chance to mix in between additions, until it is just very slightly tacky to touch. If you do not have a stand mixer, add all of the dry ingredients to a large bowl. (See recipe notes for bread machine advice). Pour in the water and liquid (but room temperature) oil then stir briefly to combine and absorb the dry flour. Turn out onto a lightly floured surface and knead for at least 10 minutes until the dough is completely smooth and elastic. If after a few minutes of kneading it feels sticky, add a tablespoon of flour at a time, kneading in between additions. It should be slightly tacky but not sticky. When kneaded properly, if you put your hands either side of the ball of dough and squeeze inwards, it should bounce back slowly when you let go. Once the dough is kneaded adequately and is smooth and elastic, place in a lightly oiled bowl and cover. Use a bowl cover, damp clean dish towel or cling wrap. Leave in a draft free area until it has doubled in size (around 1 hour although this will vary depending on how warm the environment is). You will get the best flavour by not rushing it so I advise just leaving it on the kitchen counter and not moving it somewhere really warm to speed it up. Line a large baking sheet with parchment paper and sprinkle it with cornmeal or flour if you don't have cornmeal. Once the dough has doubled in size, turn it out onto a lightly floured surface and roll it out with a rolling pin until it is about 1 inch thick. Make sure it is even all over. Use a cookie cutter (about 3 inches in diameter is good) to cut rounds and place them on the prepared baking sheet. If you don't have a cookie cutter use the top of a glass or a mason jar lid. Be sure to cut carefully and get as many as you can out of the first batch of rolled dough because the muffins from the first batch are always slightly better than those made with the remaining dough. When you have cut as many as you can, ball up the remaining dough as gently as you can and re-roll it then cut out the remaining muffins. Sprinkle the tops of the muffins with more cornmeal (or flour) then cover and leave again until almost doubled in size. It won't take as long this time. Usually about 30 - 40 minutes. If you have a griddle, heat it to a medium low heat. I have an electric Cuisinart Griddler and set mine to 350°F. If you don’t have a griddle you can use a heavy frying pan or skillet instead. When the griddle is to temperature, or when your skillet is preheated, place as many muffins as will fit comfortably (with sufficient room to turn them easily), VERY gently on the griddle. It’s important to be as gentle as possible because you don’t want to knock any of the air out of them. Cook for 5 -7 minutes until beautifully golden on the bottom, then VERY gently turn them over and cook for another 5- 7 minutes. If you would like to make this recipe in a bread machine, add all of the ingredients to the pan in the order specified by your manual. I think most like the water to go in first, followed by the flour then the other things. Set to the dough setting. When finished remove and follow my instructions from step 8. These muffins keep for around a week. They are good just as they are for the first day or two, then are best toasted. The recipe can easily be doubled and muffins freeze very well.